Hey everyone, belated holidays to you all, things have gotten super busy for me since grad school started so I haven’t had time to update the site at all. I don’t expect I’ll be able to update the site much until the summer or so, so expect things to keep pretty slow around here. 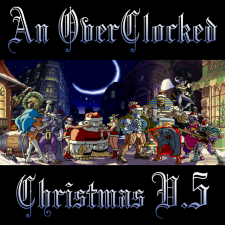 Anyway, OCRemix released another Christmas themed album and you can find it here. One track from the album is by Rozovian, who I’ve mentioned before in a few updates (he’s heading up the secret SD3 album, more news on that soon… possibly). It’s a remix of A Cold Beat from Heroes of Mana, and it’s the first HoM remix I’ve heard myself. Check it out! Don’t forget to check out the rest of the album too. I’ve always liked this track. It’s kinda funny and I’m sure that’s what the entire Mushroom village area was going for. King Truffle is awesome. Unfortunately my SoM CD has a scratch I guess, and whenever it plays the last half of this song it does it in hyperspeed, it’s pretty bizarre. Another Monday full of music, and with a site update to boot! The following remixes have been added to our remix section, which was falling a bit behind (my bad, sorry). These have been contributed by the good old people at OCRemix. You’ll be able to find them easily on the pages for FFA, SoM and SD3 as they have the icon next to them. I’ve picked out this one in particular, Step Off my Flower Bed, by Nase, simply because there’s so much going on in the remix, you should listen to it several times and will keep picking up more as you revisit it.